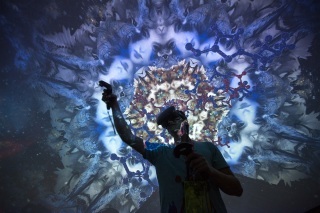 File image of a man trying out a virtual reality game. Electric skateboards, haptic suits and future food, oh my! Take a peek into the future at Worlds Fair Nano on Saturday, March 10 at Pier 48 in San Francisco where tech, talk, art and food collide. Attendees can experience a virtual reality by flying drones, racing electric skateboards and drawing with 3D pens all while engaging in conversation about the future of artificial intelligence, space exploration and immortality – yes, you read that right. Light-emitting diode (LED) art installations and other interactive art will be displayed and future food is on the menu featuring chewable coffee and cricket powder protein snacks. The futuristic fair will also present music by DJ’s who will create music in virtual reality.